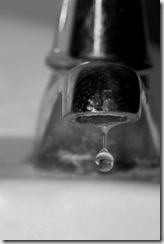 A faucet that drips just once per minute will waste over 4 gallons of water every month, and over 52 gallons per year. While once per minute may not seem like much, its easy to see how it adds up over time. Faucets come in two different designs, washer-type or compression, and washerless. To repair a washer-type faucet, first turn off the water supply either through the shutoff valve beneath the fixture, or at the main shutoff valve for the house water supply. Take the faucet apart. Washer type faucets work with a rubber washer that closes onto a metal washer seat. This rubber washer can harden or worn, causing the faucet to leak. Check for signs of damage and replace if necessary. Another common cause of leakage is the stem of the faucet. If the threads are badly corroded or worn, it may be time to replace it. A leak in a washerless faucet usually means the faucet needs replacing. It is a sign that the parts aren’t working properly, and simply need to be replaced. In some cases, a prepackaged repair kit may be available, depending on the type and style of faucet you have. If you have noticed a leak, finding the time to fix the problem can also be a chore. A plumber can assist you in finding the problem. Or if you’ve purchased a new faucet, and can’t find the time to install it, a plumber can have it quickly installed for you.